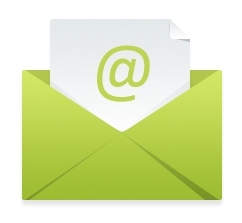 Can Publishing an Ezine (Email Newsletter) Benefit Your Business? Let me see… hmmm… Yes! Sending an ezine on a regular basis, can substantially (yes I said substantially) increase the bottom line in your business. Newsletters are an accepted and well received marketing tool for busy business owners. I’m surprised more people don’t utilize this effective and easy to use tool. 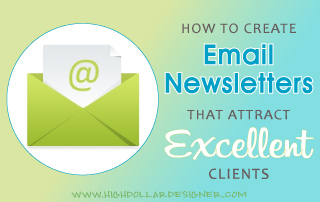 If you want more clients, without spending a ton of time and money… a newsletter is a must! 1. Your #1 Resource … A newsletter helps you stay in contact with THE most important resource in your business… “Your Previous Customer.” You already have a built in list of people that know, like and trust you. Why are you not talking with them and keeping in touch, telling them about the latest project you’re working on? Silly! 2. Without a newsletter … You have no way of following up with your paying clients, or for that matter, any potential customers in a non-threatening way, without one. Someone that has purchased from you once is very likely to purchase again. You don’t want to run the risk of losing that person to another business because you don’t have a follow up method in place. 3. How often to send it … The standard for publishing your newsletter is generally 2x per month. However, if you find something of value that your readers might be interested in, you can send it to them right away. 4. What to write about … Your topics are determined by your area of expertise – kitchen and bath design, window treatments, furniture manufacturer, etc. If you want to do the research and write the articles yourself, there’s no shortage of information on your topic, on the internet. Or, if you don’t have the time or the inclination, you may want to consider purchasing articles that can be re-written. It’s a much easier task / process than starting from scratch. 5. How long should it be … Your newsletter doesn’t have to be “The Great American Novel.” As a matter of fact… if it’s too long, your readers will probably lose interest before they get to the end. Sometimes a quick announcement about a new product line, or service will do the trick. Other times a short 400 to 500 word article is what’s needed. It will really depend on what you’re trying to convey to your readers, but it’s good to shake things up a bit and give a variety of things for your readers to consume. 6. Reliable … You’ll need to be consistent. With the thousands of newsletters that are available. You’ll want to avoid having yours mistaken for spam. Announce your publication in the subject line and don’t forget to personalize it by inserting your subscribers’ first name. Address them by their first name within the body of the message whenever possible. Personalization can’t be stressed enough. 7. Spam Spam Spam Spam … To limit complaints or spam reports remind your readers that they agreed to receive emails from you etc. Most email providers offer this function without your having to do anything, other than setting up your newsletter and push send. 1.If you don’t have an ezine yet, commit to starting one right away. Set a goal. Do whatever it takes. 2. If you haven’t kept a list of emails from your past clients & contacts, start by collecting them now! Right away.. don’t wait another day! Begin with those you’ve come in contact with in your business, such as past clients, prospects, vendors, family members, friends, networking partners, grocery store clerks, etc. 3. Set up a spreadsheet and add the following in 3 columns – First Name, Last Name, Email Address. Keep them separated. When you get that set up and filled with some names, you can upload the entire spreadsheet to an email service provider. Your newsletter can be a VITAL part of your brand and a heavy hitter in your marketing toolbox. It can and will speak loud and clear about you, your business, what you have to offer and more. It’s a tool for building relationships with your clients – past, present and future. No other marketing tool has this ability. Give your newsletter the time and attention it deserves and it will reward you over and over again. 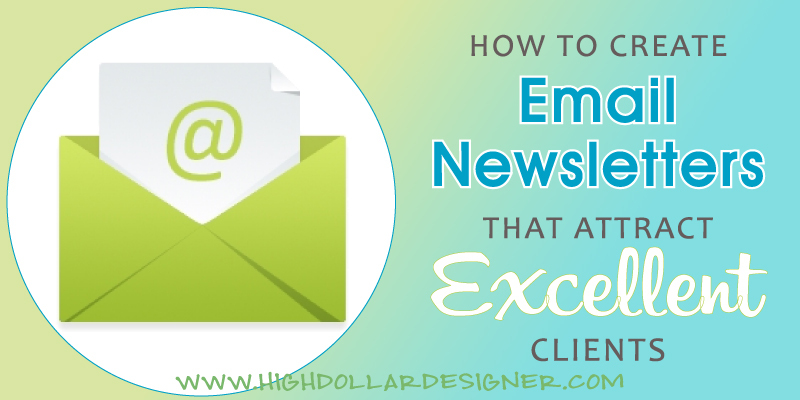 Do you use email newsletters? Or have you tried them in the past? What were your results? I’m interested. Or if you have any questions, feel free to let me know in the comments below. Hi Kelly! If you look at the newsletter that I send out, that will give you an idea of how you can set one up. Another thing I do is subscribe to various ezines to see how they set theirs up and what they send. I published a one page, three column newsletter by email monthly for 10 years. I included original material of interest which I discovered in the course of doing research for my clients and in attending industry educational events. Nothing was downloaded, everything was original. I never got a single customer or call back from an existing client, although I did get a few “thank yous” which you could count on one hand. There must be some special way of doing the newsletter. I would like to see examples of newsletters that did get calls or appointments or any desirable result. Hi Helen… Ugh that must have felt frustrating to do all that work and not get the results you desired! There are different goals / reasons for sending an ezine. Each strategy requires the ezine to be set up in a very specific way, include certain things and the timing of when you send it varies as well. I’m in the middle of creating a series on successful email newsletters / ezines. It should be ready soon. If you have any other questions, let me know here in the comments, so I can be sure to get them answered for you.